Stephen and Lori Lauckner spent the last five years renovating the back of their home at 67 Whipple Road, the home Stephen has lived in since 1971. The home was heavily damaged in a recent fire. KITTERY, Maine — Stephen and Lori Lauckner spent the last five years renovating the back of their home at 67 Whipple Road, the home Stephen has lived in since 1971. Lori had just overseen the installation of the kitchen of her dreams from when she married Stephen after the passing of his first wife, nearly 20 years ago. In an instant on March 31, the vision of their addition was destroyed when a fire broke out on their front porch. 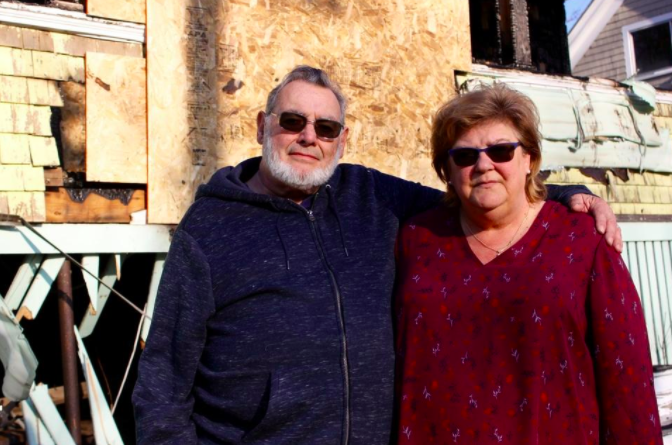 The couple did not yet know if their insurance company will rule the home a total loss, but Lori said the home was declared an unsafe structure. Since the fire, the family has been staying with one of Lori’s daughters in Lebanon. She said the couple is grateful for the support they have received from their friends, family and neighbors. She said their insurance company was looking for accommodations for the couple while their home is being rebuilt. In less than a week, an online fundraising page set up by a family member has raised nearly $5,000 in donations from community members to help the Lauckners recover. She also said The Farm restaurant in Kittery hosted a fundraiser for the couple, but she did not know the exact amount that was raised.